CHITTAGONG, Bangladesh — Heavy monsoon rains and landslides have killed at least 134 people in southeast Bangladesh, burying many in their homes as they slept, authorities said on Tuesday. Three young children from the same family were among those killed in the disaster, which comes just weeks after a cyclone battered the region and destroyed camps housing thousands of Rohingya refugees. Police warned the death toll would likely rise as emergency workers reached remote parts of the Chittagong Hills, where telephone and transport links had been cut. Manzurul Mannan, the government administrator of the worst-hit Rangamati district, said at least 98 people were killed in the hilly region alone. "The death toll might rise," Mannan told AFP. At least 30 people were killed in neighbouring Chittagong and another six in Bandarban, officials told AFP, adding about 15 people were missing, feared buried under chunks of mud. Many of the victims were from poor tribal communities in the remote hill district of Rangamati, close to the Indian border, where mudslides buried hundreds of homes. One woman described the ground sliding from beneath their family home in the dead of night, sending them fleeing to a house next door. "A few other families also took shelter there, but just after dawn a section of hill fell on the house. Six people are still missing," Khatiza Begum told local news website Bangla Tribune at Rangamati hospital. District police chief Sayed Tariqul Hasan said most of the landslides happened before dawn Tuesday. "Some of them were sleeping in their houses on hillsides when the landslides occurred," he said. Police and local authorities ordered the evacuation of thousands of people living in slums at the base of hills in the neighbouring district of Chittagong, where 30 people have been confirmed dead. At least 126 people were killed in that district when a massive landslide buried a village a decade ago. In the latest incident six people were killed in the nearby district of Bandarban, among them three children buried by a landslide as they slept in their home. Authorities have opened 18 shelters in the worst-hit hill districts, where 4,500 people have been evacuated, disaster management and relief minister Mofazzal Hossain Chowdhury Maya told reporters. Head of disaster management department Reaz Ahmed said disaster response teams had been deployed but had not yet been able to reach all the affected areas. "Once the rains are over, we’ll get a full picture of the damage and get the recovery work in full swing," he added. The monsoon rains came two weeks after Cyclone Mora smashed into Bangladesh’s southeast, killing at least eight people and damaging tens of thousands of homes. Rohingya leader Mohammad Anam said the latest rains had further worsened conditions in camps that were badly hit by the cyclone. "We’re living in constant fear of landslides," he said. Around 300,000 Rohingya, a mainly Muslim stateless ethnic minority, are living in camps in southeastern Bangladesh after fleeing persecution in Myanmar. Heavy monsoon rains also pounded the capital Dhaka and the port city of Chittagong in the district of the same name, disrupting traffic for hours and flooding key roads and business districts. A ferry sank in the River Buriganga in Dhaka on Monday evening with an estimated 100 passengers aboard, police said, adding all the passengers had managed to swim ashore. 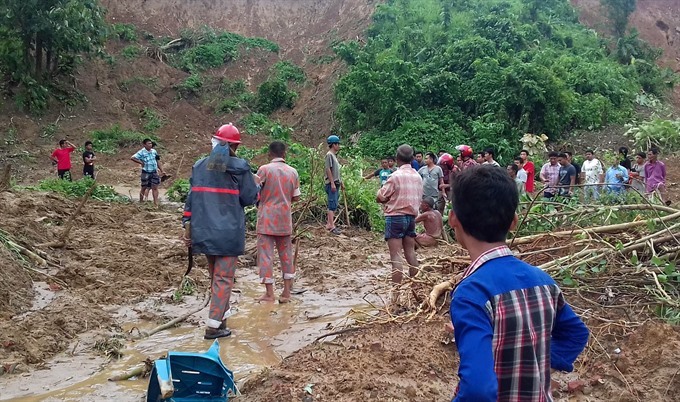 Among the victims in Rangamati district were at least four soldiers who had been sent to clear roads after an earlier landslide. Thousands of troops are stationed in Rangamati, where a tribal insurgency raged for two decades, and which still suffers sporadic violence. "The soldiers were sent to clear roads hit by landslide in Manikchhari town when they were themselves buried by a second landslide," armed forces spokesman Lieutenant Colonel Rashidul Hassan said.